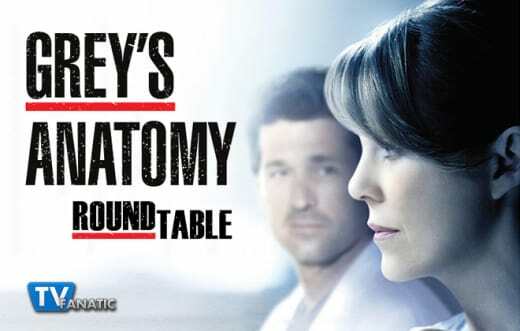 An earthquake shook things up at Grey Sloan Memorial Hospital on Grey's Anatomy Season 11 Episode 15, but not nearly as much as potential news regarding Derek and Meredith. This installment gave Stacy Glanzman, Amanda Steinmetz, Mary Kate Venedam and Christina Tran plenty to discuss regarding the state of MerDer, Owen’s case and much more. Ready to gather around and join in? Leave your take in the comments! What was your favorite quote or scene from Grey’s Anatomy Season 11 Episode 15? Stacy: My favorite story line was definitely Owen and the little girl, but my favorite quote was Callie’s advice to Maggie to let Ethan “razz her berries," etc. Amanda: I liked Callie making fun of Maggie. Loved the “Upstairs Downstairs” reference! Mary Kate: I enjoyed the entire story with Owen, Amelia, and Richard talking to the girl to help her mom, but I think I liked Owen meeting little Ruby for the first time. It was so sweet and you could see an actual connection he made to the little girl after he had helped her through something terrible. 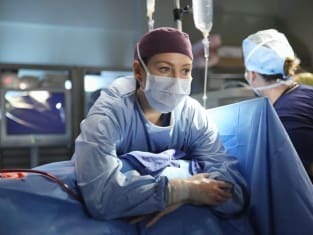 Meredith’s streak of successful surgeries: coincidence or not? Stacy: I had a feeling they were going to reveal that the streak started when Derek left. I think this separation has been really helpful for Meredith to focus and gain perspective. Amanda: I don’t think it’s a coincidence. Without Derek around to fight with and be distracted by, she’s been able to put all of her energy and focus into her surgeries. Still, it’s important that she acknowledged still wanting to share her success with Derek. Mary Kate: Hmmm...maybe?? She definitely was experiencing more stress with her and Derek fighting all the time, but I’m glad she realized that even if it wasn’t a coincidence she still wanted Derek around. Christina: Who knows?! Does it really matter that much? Like Mary Kate said, Meredith ultimately realized she wanted to share her streak with Derek. Coincidence or not -- I want MerDer back, pronto! Meredith called Derek and an unfamiliar woman’s voice was on the other line. React! Stacy: I don’t like it. I’m hoping for another explanation, but I can’t think of a good one. I really hope he’s not cheating on her. Amanda: I really hope the writers are just trying to make us all panic. We’ve already dealt with infidelity in Arizona's and Callie’s marriage. I want there to be an explanation for this woman answering the phone other than an affair. Mary Kate: Not happy. Considering the lack of response from said woman, it doesn’t look good. I can’t see Meredith forgiving easily if it is an affair because while he’s been in D.C., she’s working and taking care of their kids. Christina: I saw a few commenters suggest that it wouldn’t be surprising if Derek was cheating because it’s not like he hasn’t before. I, for one, am nonchalantly believing that the writers were just trying to leave us jaw-dropped. I wasn’t shocked, upset or anything, but I just don’t buy it. What did you think about Owen’s storyline as he was trying to guide a young girl to save her mother’s life? Stacy: I thought it was really cute, but a little unrealistic that so many doctors had time to gather around the phone and help her after an earthquake. It was nice that Amelia, Richard, and April were helping, but I think it would have been better if it was just Owen. Amanda: I wasn’t really into it to be honest. Like Stacy, I agree that it’s unrealistic anytime a group of the doctors huddle around to work on one patient. At least it resulted in Owen and Amelia hooking up. Mary Kate: As I mentioned earlier, I enjoyed it. It was something different and the fact that Amelia, Richard, and a returning April helped made it more interesting than just Owen helping her. It was a team effort. Christina: The only part that I liked was when Owen and the little girl finally met. Their scenes together make me want Owen to get a shot at being a dad ASAP. Did you like learning more about Maggie? What did you think about Ethan? Stacy: I loved Callie calling her out on her crap. That was a great scene. I’m also glad that Maggie listened and is going to put herself out there and take a chance. Good for her. Ethan is cute. Amanda: I liked learning more about her. She’s still a new character so we’re peeling back her layers slowly. She’s closed off, so it’ll take more time. I like Ethan already. Their interaction in the elevator was adorable. Plus, he’s a total cutie! Mary Kate: Sure. We haven’t seen a lot of her personal life and we know she’s somewhat guarded. I think it’ll be interesting if things move forward and what that will mean for her as a person. Christina: As I mentioned in my review, there’s something about Ethan with Maggie that makes me want to see more. So, I’m down to see more of these two. Maggie and all her awkwardness are kind of fun to watch. Titled "Don't Dream It's Over," Grey's Anatomy Season 11 Episode 16 will air on March 19 at 8/7c.